Völlig von einem Meister diese sauber renoviert, 1 Schlafzimmer, 1 Bad Kabinen verfügen über eine Küche mit einer vollständigen Palette, Mikrowelle und Mini-Kühlschrank. Mit dem Nötigsten benötigt, um selbst zu kochen, wenn Sie dies wünschen, eingerichtet. Alles, was Sie können müssen, nur bitte ich haben wahrscheinlich einen zusätzlichen in meiner Küche. Great location and charming cabins! The owner Laura is above and beyond accommodating and the cabins are cozy, clean, and all that you need for a Montana getaway. 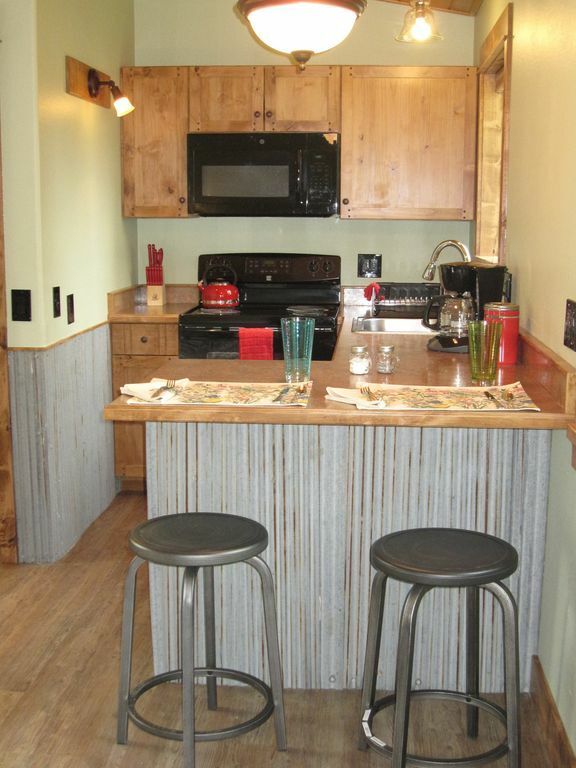 The property and cabin were very clean, nicely decorated, well stocked with the basics. The owner was extremely accommodating to our travel plans. It is literally right off Hwy 2 so we had the noise of the early morning traffic. Definitely a good choice. The cabin was very clean and welcoming. We arrived and everything was exactly how we expected. This cabin is perfect as a home base for time at Glacier Park! The cabin is well equipped; clean, the bed is comfy, the kitchen is stocked with everything you need to get ready for busy days exploring the area, plenty of information about things to do in Glacier Park. It is a bit hard to find the driveway in the dark, but we did. Thank you Laura! The property has great access to the west entrance of Glacier National Park. The cabin is immaculate with excellent amenities. We felt very comfortable in the space and enjoyed the self catering option that the cabin offered. Laura, our host, was very helpful with recommendations, in advance of our stay. And Toby, the visiting Labrador, was an added bonus! Wonderful cabin! Great place to stay! This cabin was exactly what we needed as our homebase for visiting Glacier. A bed big enough for two, a hot shower, and a kitchen stocked with everything we needed to cook meals. The local coffee that Laura supplied was a nice touch - I am addicted now and bought a couple bags from Montana Coffee Traders. Another biggie is that these cabins are pet friendly - we brought our dog with us which was so nice! Laura was a great hostess and a wealth of knowledge for places to go. Her dog Toby was a sweetheart as well. When we come back, we will definitely be staying at the Trapline cabins again. Thanks for having us! Wir lieben das Leben im Nordwesten von Montana, wo Sie immer noch wilde Abenteuer finden können. Wildwasser-Rafting auf der Middle Fork des Flathead River. Fliegenfischen ist reich an Bereich Flüssen und Bächen. Rucksack, Wanderung, oder zu Pferd in Glacier Nationalpark. Besuchen Sie eines unserer weniger gereist Wildnis Zugang areas- Jewel Basin, Hungry Horse Reservoir, Great Bear, oder Bob Marshall Wilderness. Mountainbiker werden das Whitefish Legacy Trail-System lieben oder die Abfahrten im Whitefish Mountain Resort genießen. Whitefish Mtn. bietet auch Hochseilklettern, Wandern und anderen Freizeitaktivitäten. Full refunds available up to 30 days before check-in date. Pet Fees- $25.00 per pet per stay.